Umbria is a destination for those who like to do outdoor activities and nature lovers too. For example you can explore Umbria by bike, or you can visit Monti Sibillini park. And what do you think about outdoor activities? Valnerina is the right destination for you. Today I will introduce you Monte Cucco Park, that is a protected area situated in the northeastern part of Umbria, on the border with Le Marche. It extends for almost 10.500 hectares around the peak and conserves several signs of karst phenomena and fossil deposits, as well as archeological ruins dating back to Roman settlements. Its deep valleys are crossed by clear streams and mineral water springs and covered by beech woods but, above all, the park is famous for subterranean rivers and the huge limestone cave system: hundreds of caverns born thousands of years ago, in every size and shape. The park has different entrances, but choosing the one from the ancient Via Flaminia you can visit the little towns that stand within the boundaries of the Park and enrich its natural backdrop with their defensive walls and towers: Sigillo, Costacciaro, Fossato di Vico, and Scheggia, with an itinerary through monasteries and hermitages. It’s a perfect place for those who love sports, thanks to almost 120 km of well signaled routes which create a thick network on the whole mountain area. It’s unmissable for rumblers, but also for those who want to practice mountain biking, riding, hang-gliding, cross-country skiing and even canyoning. 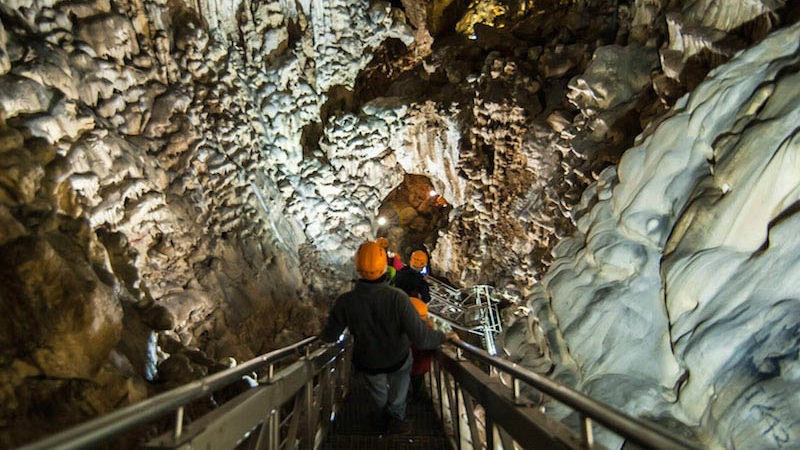 The core of the park is represented by the famous Grotta del Monte Cucco: it pierces into the dephts of the mount for almost 30 km and it’s one of the larger and deeper cave system in Italy. The grotto is accessible by 4 entrances situated on the eastern side of the mountain. The Galleria Nuova one is probably the most suggestive because it leads through a series of huge chambers in fast succession, framed by beautiful stalagmites and stalactites on the walls and a lot of small emerald puddles, where quavering circles are caused by the continuous dripping of water. Another beautiful location inside the grotto is the Galleria delle Ossa (i.e. Bones’ gallery), where lie numerous bones of ancient animals that lived there during the last Ice Age, such as bears, ibex, rhinoceroses, cattles and deers. There are also other minor grottos that are very easy and safe to explore, and all of them are important sites for researches in every field of natural sciences, especially for speleological and hydrological studies – activities here practiced for centuries. or the Percorso Scoperta (discovery trail). The first one starts from the Centro Escursionistico Naturalistico Speleologico of Costacciaro and lasts 4-5 hours. After an hour-walk, one goes into the grotto and follows a trail through ladders and footbridges, visiting the series of wide impressive chambers above mentioned. The Discovery trail, instead, starts and finishes at “La Valcella” – on the eastern side of the mount – and lasts 2,5-3 hours. 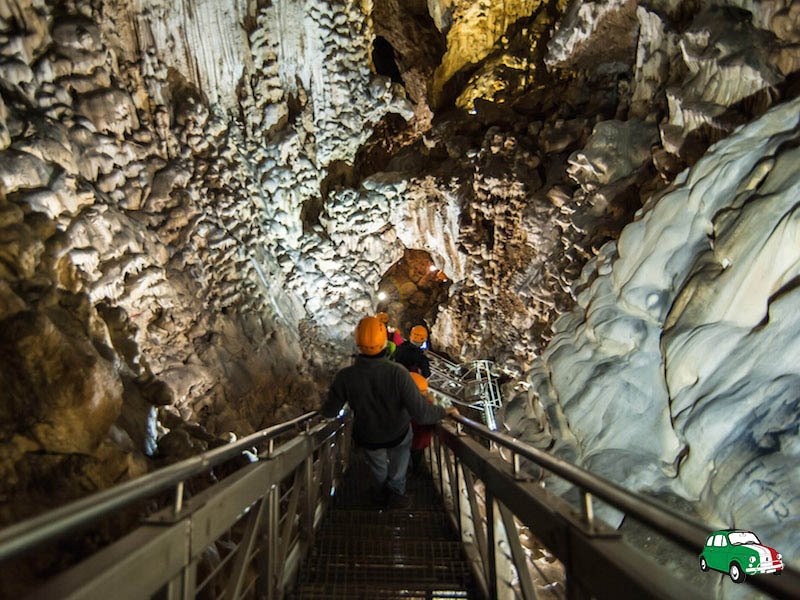 If you are a caving enthusiast, there’s another possibility for you. The ‘Adventure Route’ follows the classic trails but with extra visit to the Galleria delle Colonne (i.e. Coloumn’s Gallery), one of the most beautiful and impressive places inside the cave system of the mount. There is a good news for those who want to discover this territory and try its paths. Monte Cucco Trekking is a new app that can help you with full information concerning about 50 trails and all indications to choose the right trail for your ability, as well as the possibility to check a list of free Wi-Fi spots and to localize your position by means of GPS system, communicating it to the rescuer in case of emergency. Are you wishing to visit the Grotta del Monte Cucco? Have a look here for all information. If you have any question, write a comment below.